Hot Melt Cleaner, Hot Melt Cleaning Products. Make your hot melt system perform like new! Hot Melt Purge, Hot Melt Cleaning Kit - Everything you need to make you machine perform like new again! 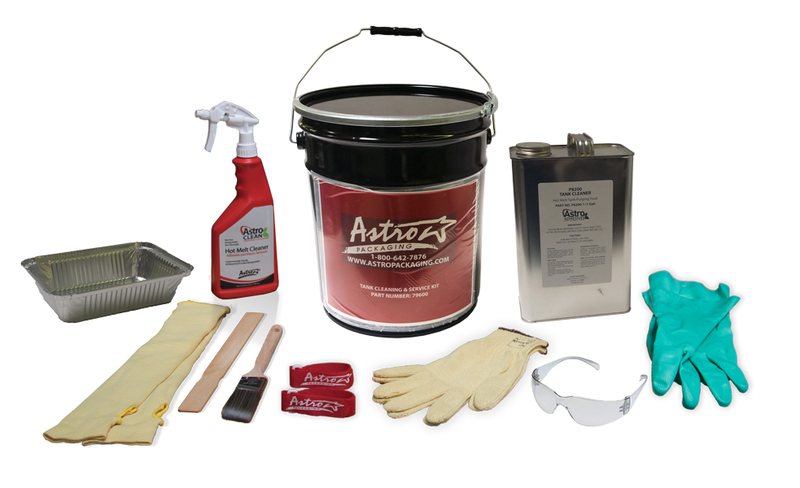 Astro Packaging’s hot melt cleaning kit includes everything you need to flush out and clean your hot melt system, maximizing the performance and lifetime of your equipment. Hot melt purge and flushing solutions help remove dirt and charred material that can plug nozzles and clog the melters, leading to downtime and poor system performance. Astro Packaging recommends quarterly maintenance programs and should also be done any time there is a change in adhesive material. Hot Melt Purge - 1 gal.